Ryan, the young host of the YouTube channel Ryan ToysReview, has been named one of the world’s highest paid YouTube stars of 2017 by Forbes. When most people think back on the child celebrities of their time, they likely think of child movie actors, the well-trained stars of showbiz. For some, these were stars like Mary-Kate and Ashley Olsen, or Macaulay Culkin from “Home Alone.” For others, they were Judy Garland or Shirley Temple. Combined, the world’s 10 highest-paid YouTube stars earned $127 million, up 80 percent from last year. 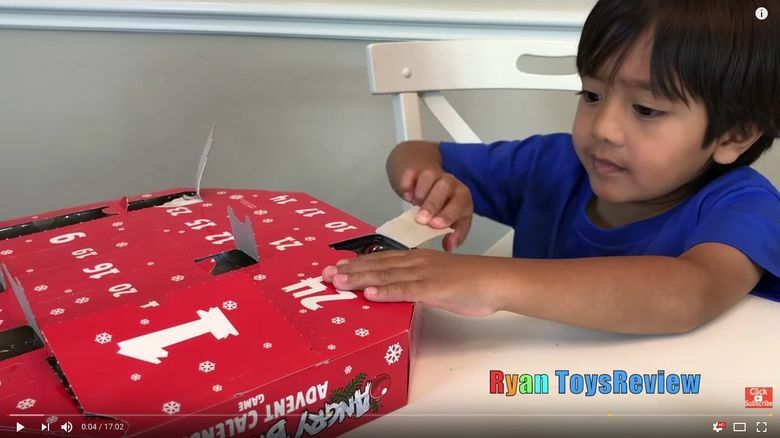 According to Forbes, this boost came thanks to ad dollars from a surge in views — including a healthy sum from “Ryan ToysReview.” During the 12 months considered by Forbes, “Ryan ToysReview” counted over 8 billion views. “Ryan ToysReview” took off. Views started doubling every month. In January of 2016, he hit 1 million subscribers. A year later, he had more than 5 million. Now, he’s at more than 10 million subscribers and over 16 million views. Ryan’s popularity makes perfect sense. He’s got every small kid’s dream job, opening toys and playing with them, day after day. He’s smiley, too, totally non-threatening to parents and children alike. No bad words. No preachy banter. He’s a miniature Mister Rogers but without the sweater and slippers. “It’s Lightning McQueen!” he says excitedly as he opens one to find a toy car from the Disney movie “Cars.” And wow, in another there’s a character from “Paw Patrol,” in another, there’s Spider-Man. His parents told TubeFilter in September of last year that 99 percent of the channel’s videos aren’t branded. At the time, the parents said they paid for all of the toys that Ryan reviewed. It’s unclear how many toys he currently reviews are sent to him by sponsors, but his video descriptions often include dozens of links to name-brand items. According to his channel’s “about” page, the family donates most of the toys to charity after Ryan reviews them.